This is an updated garage scene from the Mac’s Mini Rod app. Mac is a boy that loves to hang out with his dad. They share the same passion for building sick hot rods. So Mac made his own work area and started building his designs out of found parts from around the garage. In this story you will learn more about Mac and his cool Mini Hot Rods. You will even get a chance to build them yourself and give some customization to each individual car. 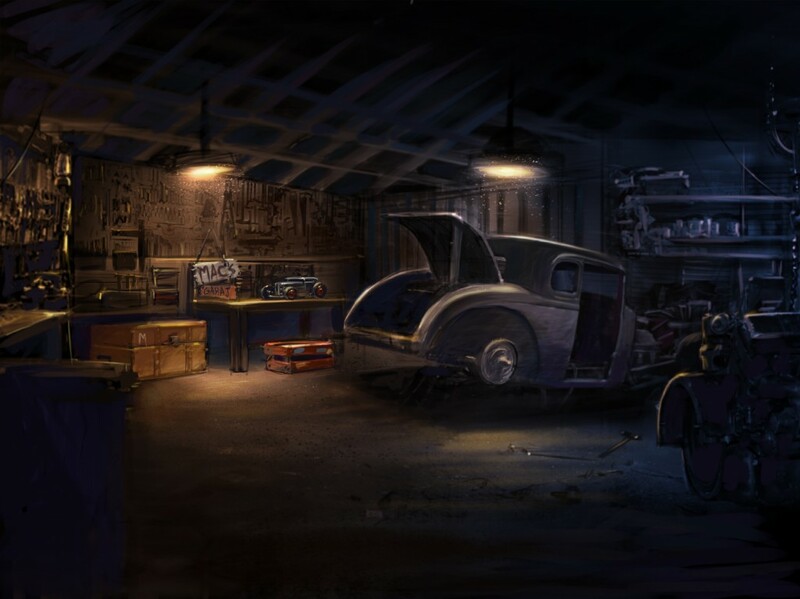 This Garage scene was done in Painter 12 with my Wacom Cintiq 21 UX and took approx 8-10 hrs to complete. So look for more updates on this app in the future. In the mean time I am taking a week off this week and I will resume on the 28th of August. When I return I will be putting together the next tutorial series on improving your sketches. So have a good week and see you when I return. I to suffer from mild depression and am very happy that you are on your way to where you want to be. Great Luck!!!!!!!!!!! !